Trans-Matic Manufacturing Company, Holland, MI, received the 2014 Higgins-Caditz Design Award for its Allegion/LCN door-closer project. Trans-Matic provides engineered deep-drawn metal stamped components, value-add mechanical assemblies and proprietary products. The award-winning project involved the reengineering of several door-closer components for door closers made by the LCN division of Allegion. The door closer originally comprised a cast cylinder body using several machined parts. The Trans-Matic team visited the LCN production facility and observed the current production-machining processes. 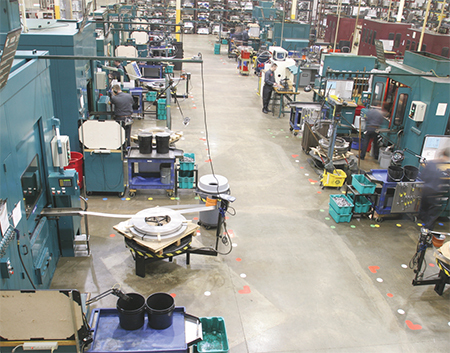 The group ran stopwatches, looked at maintenance logs, quality levels, material usage and scrap losses, and saw the potential for significant savings if the machined parts could be made as deep-drawn stampings. The resulting concepts included combining the spring tube and spring-tube cap into one deep-drawn spring-tube stamping (overall length, 4.75 in. ; material thickness, 0.090-0.095 in. ), and converting the machined, threaded and broached end plug into a deep-drawn and threaded stamping (0.110-in. wall thickness, low-carbon high-strength steel). The requirement of the spring tube to withstand high burst pressure led to a design with three strengthening ribs. However, simulation showed that the ribs could actually become stress risers. The other concern was the transition of the ribs to the flatted head. Another simulation was run with slightly thicker material and a straight deep-drawn shell. The alloy originally tested was a typical low-carbon alloy steel; ultimately, the best combination became a straight shell 0.090 in. thick, while bumping up the carbon content of the alloy to improve strength. The work-hardening from the deep-draw process provided more than enough strength to meet the LCN performance and cost requirements, and proved to be as strong as the 0.125-in. machined spring tube. 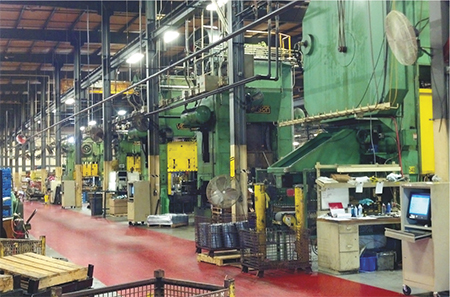 Trans-Matic now manufactures the spring tube and cap in a 16-station transfer die using a 600-ton Minster transfer press, and manufactures the end plug in a 13-station transfer die using a 300-ton Waterbury transfer press. Does Your Metalforming Company Deserve Recognition in 2015? 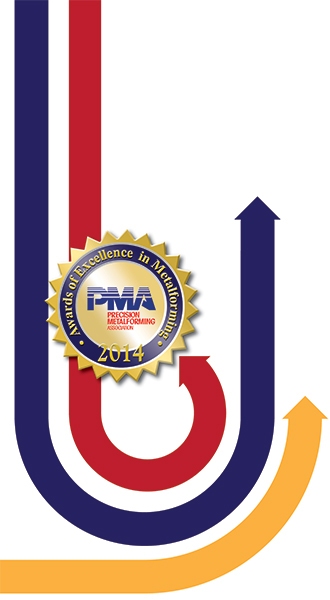 Share your success—and brag a little—by submitting an entry for PMA’s Awards of Excellence in Metalforming 2015. It’s your chance to recognize employees and earn industry recognition. To learn more, visit www.pma.org/awards, or contact PMA’s Christie Carmigiano at 216/901-8800, ccarmigiano@pma.org. The new parts in production today are less costly than the original parts. Trans-Matic also adds a screw-adjustor assembly to the spring tube, providing additional savings to Allegion. The project created several benefits to Allegion, including an overall 27-percent cost reduction. The redesigned spring tube and end plug also reduced assembly weight and material consumption by 22 percent compared to the original machined designs. And, incorporating the tube cap into the stamped spring tube reduced the number of components in the door closer to two deep-drawn parts rather than three machined parts. Created by the Worcester Pressed Steel Co., Worcester, MA, and sponsored by The Quarterly Club, the Design Award recognizes a manufacturing company for outstanding achievement in developing an innovative product design. Trans-Matic received a $1500 cash prize. Trans-Matic Manufacturing Company also received the 2014 Ulbrich Award for Excellence in Product Development, for developing a deep-drawn titanium housing for a premium-value air wrench. 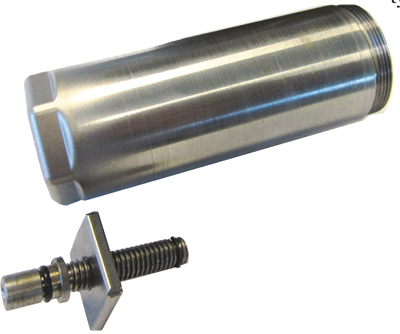 The air tool previously comprised an investment-cast titanium housing that was machined and required drilling and threading of mounting holes. 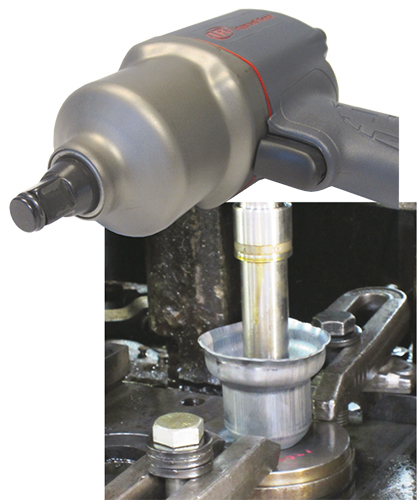 To reduce the cost of the housing, Ingersoll Rand approached Trans-Matic to investigate and develop a production process to deep-draw the titanium housing and assemble it to a new steel insert. The savings would come from reduced processing and machining costs by using a work-hardened deep-drawn Grade 2 titanium shell 0.062 in. thick. The Trans-Matic engineering team ran multiple forming simulations with the company’s proprietary software/database to define material properties, determine forming feasibility and validate tooling designs and reduction ratios for each tool station. The deep-draw prototyping process for the titanium parts (0.062 in. thick, and 3 by 3 by 3-in. part size) required a 300-ton stamping press, and the hand transfer of flat blanks and subsequent formed parts through several punch/die stations. After the prototype shells were formed, edges were trimmed square. To assemble the housing to the steel insert, Trans-Matic developed two concepts, one using a structural adhesive and the other a unique mechanical interlock design accomplished using side swaging. Both processes met all pull-test requirements. The end result was a high-value titanium deep-drawn housing assembly made in the most cost-effective way possible. Along with developing the deep-draw process to tackle the difficult-to-form titanium material, Trans-Matic also developed an anti-galling raw-material surface pretreatment; wound up with a new low-friction lubricant formulated specifically for deep drawing of titanium with interim annealing; and engineered a way to provide temperature control and cooling of the tooling and parts during forming. Among the benefits to the customer: cost savings and a slight weight reduction. Production parts run on a 400-ton automated transfer press. Winners were honored with a special plaque, commemorative flag and a cash prize. The Quality Award, sponsored by Waukesha Metal Products, Sussex, WI, recognizing outstanding achievement by a manufacturing company in the development and implementation of a company-wide quality system that effectively uses continuous improvement. Excellence in Process Control, sponsored by Link Systems, Nashville, TN, promoting the application of electronic-analog closed-loop process controls in the metalforming process by recognizing innovative electronic solutions implemented by a North American manufacturing company, which have resulted in significant quality, cost reduction and/or productivity improvements. The Product Development Award is sponsored by Ulbrich Stainless Steels and Special Metals, Inc., North Haven, CT, acknowledging a manufacturing company that demonstrates outstanding innovation in developing and manufacturing a product that best uses metal in place of a nonmetal competitive material, or that develops a product using flat-rolled material that was previously manufactured using more costly manufacturing processes. Trans-Matic received a $1500 cash prize. Pentaflex, Inc., Springfield, OH, received the 2014 Pitcher Insurance Agency Safety Award for its outstanding safety and health program. The company is a contract stamper specializing in deep-draw, heavy-gage stampings and welded assemblies for the heavy-truck market. It also services the automotive, agricultural, off-highway and defense industries. When rebuilding its workforce after the economic downturn of 2009, Pentaflex experienced an increase in injuries. Recognizing the need to address its worsening safety record, Pentaflex recharged its safety program and the results have been significant. From the fourth quarter of 2012 through 2013, the company experienced zero lost-time injuries, a 75 percent DART rate reduction and a 50 percent decrease in OSHA recordable injuries. In 2014, despite increasing employment by another 20 percent, Pentaflex continued to experience a reduction in injuries. Key program elements include elevating safety awareness, correcting potential safety issues and training employees in safe practices. Safety training begins in a 90-day preemployment period, and within those 90 days new operators are scored on their performance and safety record and either rewarded with full-time employment or returned to the temporary services company for reassignment. The Pentaflex safety program is led by a steering committee that meets monthly to address ongoing safety programs, make plans to address new regulations, review opportunities identified by team members and establish champions and a timeframe for implementing new ideas. The committee comprises top management, production supervisors and selected associates from the stamping, assembly and tooling areas. Safety is the first item addressed at weekly senior staff meetings. A “war room” also has been established in conjunction with the Pentaflex lean-action program, with open safety items tracked on an assignment board and reviewed daily. Safety metrics are posted on performance boards in the plant and highlighted by the president to all employees monthly. A key safety topic also is addressed weekly at an all-employee gainsharing meeting. During these meetings, employees are encouraged to ask questions and relay safety issues to management. This is consistent with the company culture and goals emphasized from day one: that all Pentaflex employees go home safely every night, while providing customers with quality parts on time and treating each other and the organization with respect. The Safety Award, sponsored by Pitcher Insurance Agency, Chicago, IL, acknowledges either an effective comprehensive safety program or a specific innovative idea in the context of an effective safety program. Pentaflex received a $1500 cash prize. Pentaflex, Inc. also received the 2014 A.R. Hedberg Training and Education Award. Since 2009, Pentaflex’s employment level has doubled. With Ohio’s unemployment rate dropping to less than six percent, it has become increasingly difficult to find qualified employees, and those that are hired require significant training. Key elements of the company’s education and training system include communication, problem solving and employee self-improvement and advancement. 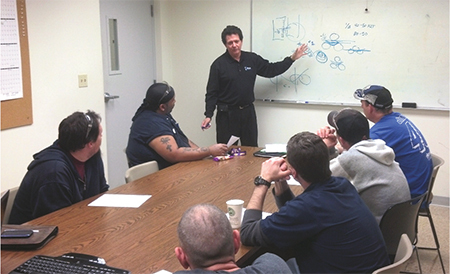 Pentaflex attacked productivity issues by providing employees with formal education regarding lean management and problem-solving techniques. It uses the 8D process to investigate customer-reported issues and internally report quality issues. To enhance the company’s problem-solving techniques, 6-sigma black-belt and green-belt training programs were initiated in 2013, with one black belt and two green belts having completed formal training to date. At the end of the classroom phase of training, the firm holds graduation exercises to reinforce the importance of lean skills. Cost-saving projects have included 5S die-change improvement and assembly-cell cycle-time reductions. In 2014, 21 employees completed the class, with seven lean projects generating nearly $100,000 in savings. As an additional resource to Pentaflex’s lean efforts, formal training programs are led by outside experts in certain areas, to improve employees’ problem-solving skills, blueprint-reading abilities and skills at operating coil-feed systems and in lockout/tagout procedures. As further evidence that Pentaflex is dedicated to improving the skills of its workforce, 100 percent of its employees have completed some form of formal training program during the past year. The company’s pay-for-skills program features dedicated skill sets required to advance from a beginning operator through five categories, with compensation rewards for completing each skill set. In 2014, 20 percent of Pentaflex associates graduated to the next skill set, with accompanying merit-pay increases. Pentaflex also works to create job opportunities and excitement in the community regarding careers in manufacturing. Each year on Manufacturing Day the company hosts students and educators for tours of its facility. Additionally, Pentaflex is involved with Clark State University, the local chamber and other manufacturers in the local Clark County Manufacturing Collaborative, dedicated to creating a pipeline of trained workers for manufacturing jobs. The Training and Education Award recognizes outstanding achievement by a PMA member company in employee technical education through a comprehensive training program. The award is sponsored by HPL Stampings, Inc., Lake Zurich, IL, in memory of A.R. (Ray) Hedberg, a leader in employee training. Pentaflex received a $1500 cash prize, to present to an educational institution that provides coursework directly enhancing metalforming technology. Metal Flow Corporation, Holland, MI, received the 2014 Zierick Manufacturing Corporation Productivity Award. The company produces high-volume and complex custom metal components through the deep-draw process and progressive-die stamping using a variety of metal alloys. Metal Flow won the award for reducing work-in-process (WIP) and finished-goods inventory, and for improving quality on a product required the welding of two deep drawn parts. The original process required components to be stamped in an individual cam-operated plunger press. Parts then were moved to an outside wash and returned to Metal Flow, where two operators per shift, working on three shifts, performed semi-automated welding to assemble the parts. The process ended with employees sorting and packing the assemblies. Now, the parts are stamped, washed and welded in a captive, lean and automated robotic-welding cell. They then are boxed into finished goods. • Inventory, including WIP, has dropped from six weeks to just five days. The Productivity Award, sponsored by Zierick Manufacturing Corp., Mount Kisco, NY, recognizes outstanding achievement by a manufacturing company in the development and implementation of programs and processes, and use of assets that lead to significant improvements in productivity. Metal Flow received a $1500 cash prize. 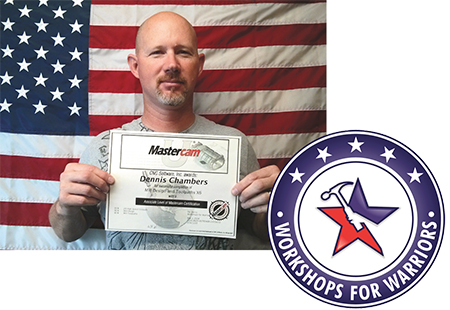 Workshops for Warriors (WFW), San Diego, CA, received the 2014 Clips & Clamps Industries Educational Institution Award for its efforts to educate veterans and place them into advanced manufacturing careers. WFW is a board-run, fully audited 501(c)(3) nonprofit offering veterans free training and certification in advanced manufacturing skills. The WFW educational program allows veterans to choose classes in welding or machining. Participants attend 4-month semesters to earn credentials from industry-leading accrediting bodies such as the National Institute for Metalworking Skills (NIMS) and the American Welding Society (AWS). All WFW training is provided at no cost to veterans, funded by private donations from throughout the manufacturing industry. The WFW curriculum features two primary tracks—welding and machining. Each class comprises classroom education and practical, hands-on training. Graduates are provided with work experience and assistance with job placement, and every WFW graduate has found a job, many within the machining/fabrication and metalforming industries. A complete program of 16 months (four semesters) leads to advanced-level training and job placement at annual entry-level salaries of $50,000 or higher. Even just one semester allows veterans to land jobs with starting wages exceeding $18/hr. WFW markets the program through outreach to active-duty service members, transitioning veterans from military hospitals’ Wounded Warrior battalions, and through community outreach. Employers regularly seek WFW graduates, recognizing the tremendous value of the training and credentials they receive. See also: Trans-Matic Mfg. Co., Inc.